View your top issues and understand their context. You might want to offer training sessions to your writers to address top issues that appear here. Optimizing the guidance configuration might be necessary. Either you can turn a guideline on or off, or you could request a change to a guideline. Top Grammar Issues Check the most common grammar issues Acrolinx corrected. Top Style Issues Find out if you can improve your style guidelines by checking the most common style issues. Terminology Issues See if your team is up-to-date with your terminology. 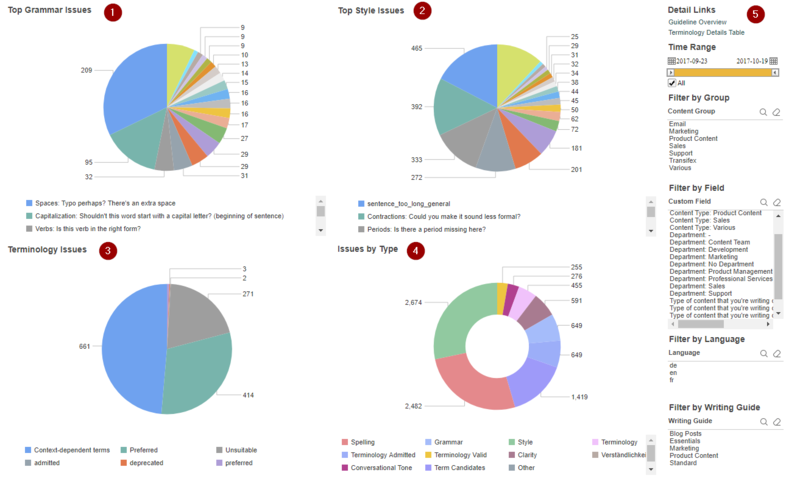 Issues by Type View all issues by type. Guideline Overview Open a table that shows you the frequency of every guideline and issue. Terminology Details Table Have a closer look at how often Acrolinx found terminology issues.